As warehouse operations turn more and more to technology to solve challenges, the Mallard team is here to provide guidance for integrating automation with gravity flow solutions. 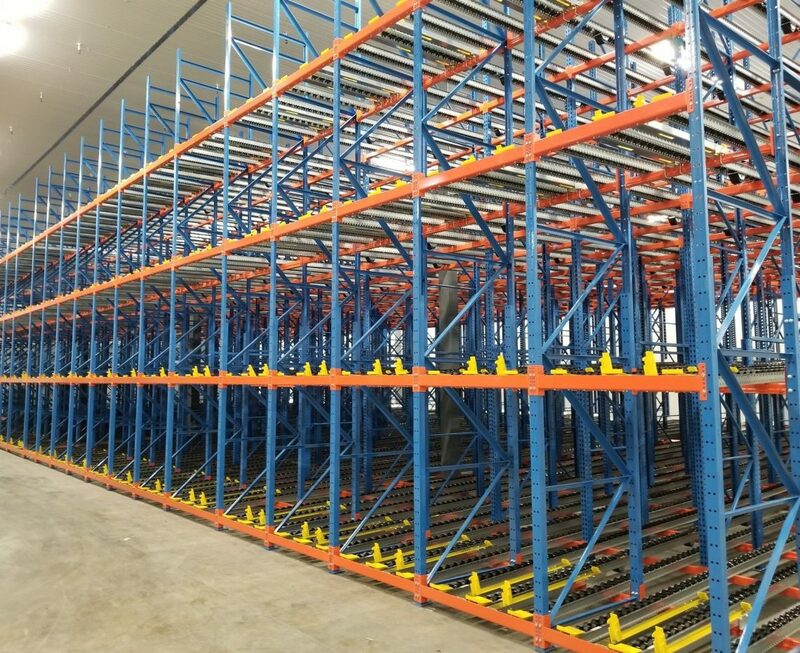 A recent example comes from our own Director of Business Development, Scott Liechty, in a recent case study titled “Automated Distribution Operations” that identifies some of the nuances of integrating AGV (automated guided vehicles) with pallet flow rack. Scott has received some great feedback from his article, so we thought we’d expand a bit on his topic to provide some more details. AGVs have many different names in the warehousing world. You may refer to them as operator-less forklifts, self-guided vehicles (SGVs), guided carts, driverless vehicles… you get the picture. Ultimately the AGVs rely on some sort of automatic guided navigation to move up and down aisles and in and around warehousing space. So why the expansion of AVGs? Economic efficiency is the answer. AGVs are becoming more affordable, while hiring, training and retaining quality lift drivers is becoming more difficult. This paradigm is leading to an increase in automated vehicles in warehousing operations across many industries. But by marrying automated vehicles with pallet flow rack, you increase your efficiency and reduce operational costs. Here are some tips to properly plan for this type of integration. Probably the most critical safety concern when using an AGV with pallet flow is pallet back pressure. 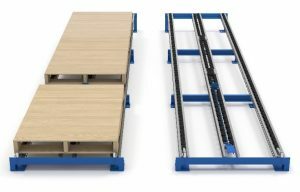 Back pressure is the force that the rear pallets place on the discharge (front) pallet when in a downward sloping pallet flow lane… particularly menacing in deep-lane systems and at higher elevations. However, Mallard has two hold-back devices, referred to as pallet separators, that eliminate this exact concern. The forklift separator is designed to hold back rear pallets until the discharge pallet is extracted. Once the pallet is picked, the separator releases to allow the rear pallets to advance. The separator automatically reengages once the front pallet position is filled. The dual-pallet separator operates in the same manner but is designed for deep-lane systems (up to 20 pallets deep). With a dual-pallet separator, the first separator is mounted behind the front pallet, while a second separator is mounted deeper in the lane to ensure back pressure relief in the mid-section and thus improve the safe advance of the pallets at each extraction. Note, when using pallet separators, the rear pallets must advance on their own from a dead stop… restart issues can often be attributed to poor quality pallets more than lane design; however, there are specific lane design considerations to mitigate restart issues and ensure success with this application. 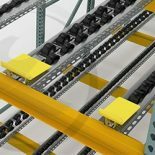 When designing your pallet flow lanes to accommodate pallet separators, you must account for 12” – 24” of additional lane length. Also note, that AGVs often require an additional clearance height between beam levels. Pallet flow accessories such as entry guides are not needed when using automated lift vehicles, but ramp stops are still often recommended. A little engineering goes a long way in these pallet flow designs as does good pallet quality. This is an instance where a Mallard in-house engineering test would benefit the customer in avoiding any hiccups. 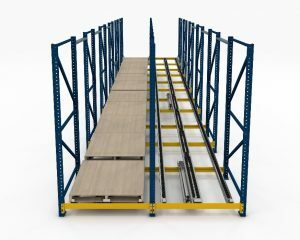 The in-house team will test the lane design using client supplied pallets and actual inventory or simulated loads (note: AGVs cannot tolerate the same weight variance as standard pallet flow). They will test for restart consistency, safe advance speeds and even tracking down lane… it’s the best way to ensure your newly installed system will work right from the start. If AGVs are in your future give us a call and we can work through the benefits and considerations of using this equipment with pallet flow racking. If you already have pallet flow and are considering moving to AGVs, let’s work together to develop the most economical use of your system for your specific needs. Whatever your gravity flow questions… we’ll do our best to come up with the answers, just contact the Mallard team.